We are looking forward to your visit and pleased to place some useful information in order to make your journey more pleasant. Should you have any questions or requests, please let us know in advance, and we would be delighted to assist you to turn your visit to St. Petersburg into an unforgettable memory. www.cbr.ru/eng - daily exchange rates of foreign currencies to Russian ruble. 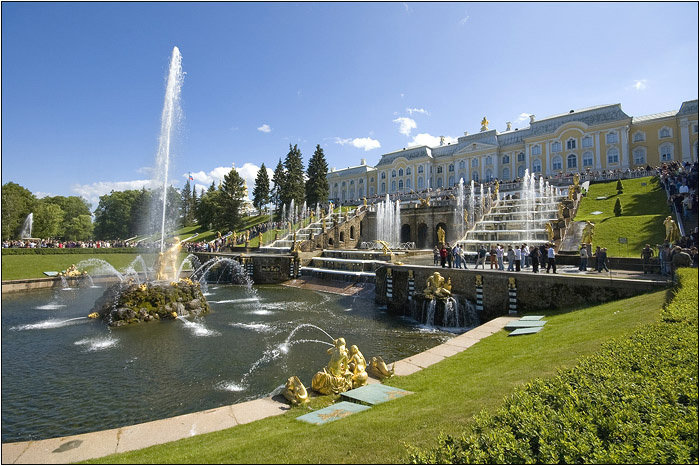 The Peterhof royal estate is a spectacular series of palaces, gardens, and fountains that were developed by Peter the Great. 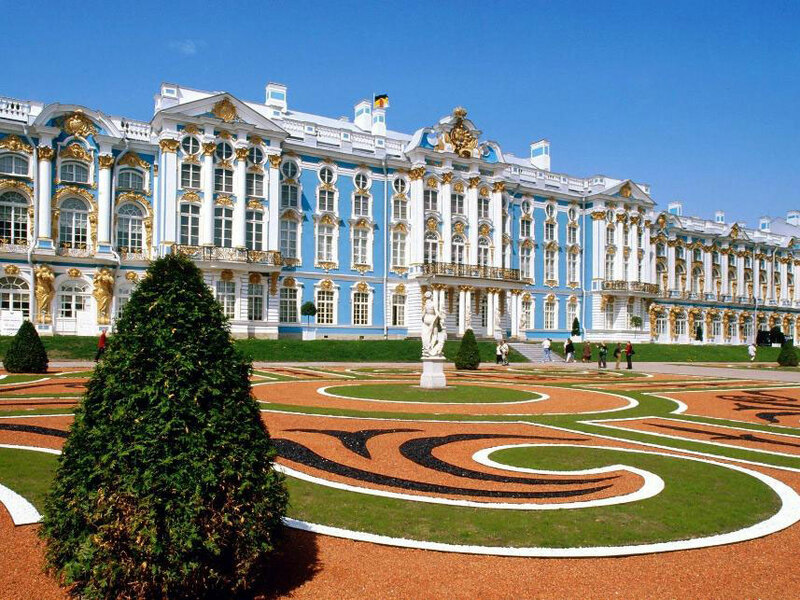 Peterhof is a series of palaces and gardens, sometimes called the “Russian Versailles”. It is located about twenty kilometers west and six kilometers south of St.Petersburg. Building of the palace and park ensemble and a landing-stage for boats bound for Kotlin Island began in the early 1700s. Peterhofs unique network of fountains has brought it worldwide acclaim. The better-known Great Cascade, consisting of 64 fountains. The palace-ensemble is a UNESCO World Heritage Site. A superb Palace and Park ensemble of the late 18 - early 19 centuries, which was erected to the designs of celebrated architects of the time, is one of the most beautiful and lyrical places of great artistic value. It history starts in 1777 when Catherine II presented these lands to her son, the future Emperor Paul I. A country residence of the Russian imperial family, it was created by a succession of outstanding architects, painters and sculptors within a relatively short span of time: begun around 1780, it was virtually completed by 1825.Charles Cameron to supervise this construction. 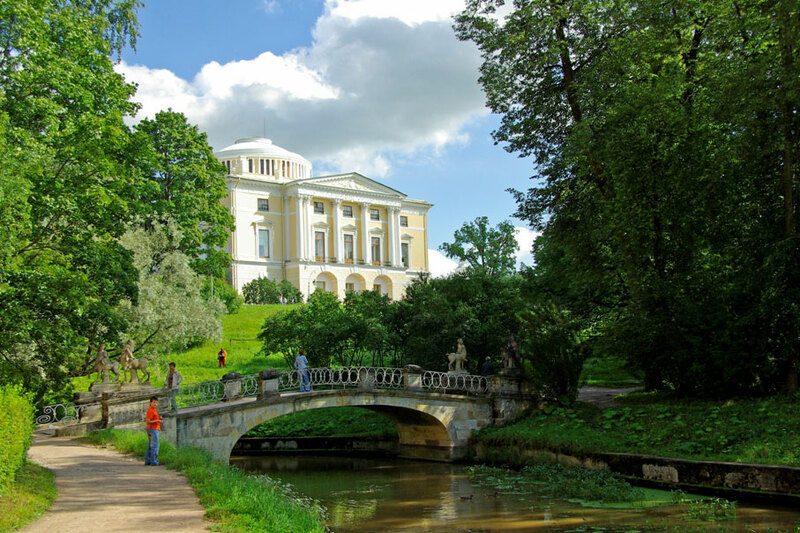 The architect surpassed himself and Pavlovsk ensemble strikes its visitors with the solemn grandeur and the heartfelt simplicity complemented by the beauty of picturesque surroundings. When Paul I ascended the throne after Catherine II's death, he ordered an italian architect Vincenzo Brenna to redesign the palace into a more parade residence and to enlarge it with the second storey and two more wings. 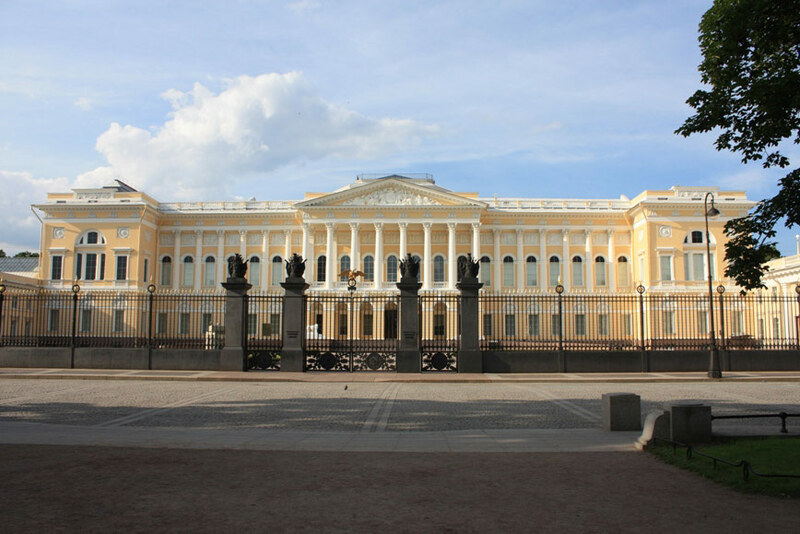 After the fire of 1803, the palace was reconstructed under the supervision of Andrei Voronikhin. Decorated through the combined efforts of the numerous celebrated architects (Voronikhin, Cameron, Brenna, Quarenghi and Carlo Rossi, the sculptors Ivan Martos, Ivan Prokofiev, Mikhail Kozlovsky, Vasily Demuth-Malinovsky, the painters Pietro Gonzago and Giovanni Battista Scotti) the state rooms of the palace became a home for a diverse art collection that began to take shape under Paul I and Empress Maria Fedorovna, who visited workshops of well-known artists, purchasing paintings, furniture, bronze articles, silk fabrics, china sets. Nowadays this collection, complemented by excellent portraits by Russian artists and a number of Pavlovsk landscape paintings and drawings is on display. Pushkin , also known as Tsarskoye Selo, a majestic monument of the world's architectural 18th century, when this site used to be a hamlet, which Peter the Great presented to his wife Catherine I in 1710. About 1727 Empress Elizabeth inherited the place, and settled there at times during Anne's reign, but as soon as she seized the crown, she made up her mind to upgrade the rustic site into an official residence. Ensemble construction’s started in 1743. Later here was built a house for Catherine and Platon Zubov, her last favourite, which acquired the name of Zubovsky, and then close to the palace church he added another house for courtiers, which was rebuilt in 1811 by Vassily Stasov for the emergent Lyceum. The park also features the Admiraly designed by Neyelov, the Concert Hall by G. Quarenghi, Creaking and Chinese Pavilion constructed by Velten, and a complex of monuments in honor of Russian martial victories. Here in 1811, the Imperial Lyceum was founded by the Emperor Alexander I. During 33 years of the Tsarskoye Selo Lyceum's existence, there were 286 graduates. The most famous of these was a great Russian poet Alexander Pushkin. Most famous point here is Amber room was first installed in the Winter Palace, but in 1755 Empress Elizabeth ordered to move it to the Catherine Palace in Pushkin. It was lost during the Second World War. A team of amber masters of the "Tsarskoselskaya Yantarnaya Masterskaya" Ltd has worked since 1982, intent on recreating the amber magnificent room. Restoring ancient amber objects d'Art, our craftsmen have studied and still use the old methods of the work with amber. This work was over at 2003. 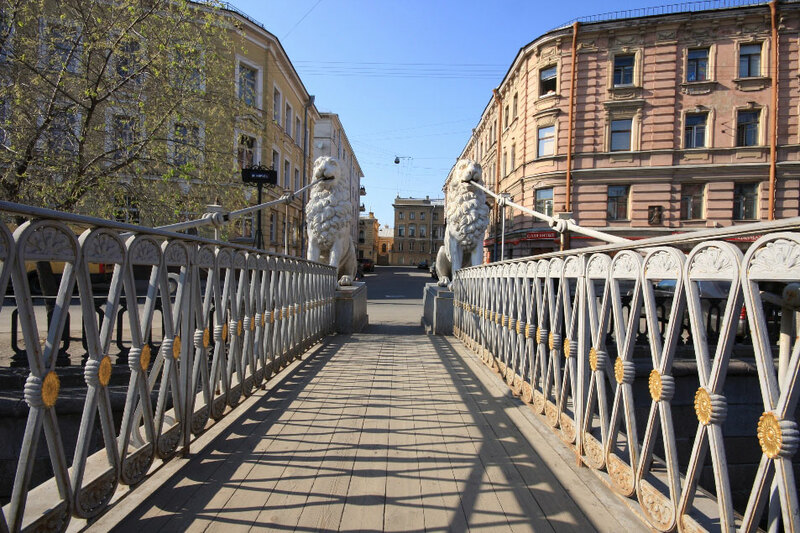 Potseluev Bridge over the Moika River (formerly known as Tsvetnoy) is located on Glinki Street. The bridge was built in 1808-1816 (with intervals, architect V.I. Hastie) in place of a wooden pedestrian bridge that had existed here since 1738 and was replaced, in its turn, by a cart three-span wooden bridge on stone piers in 1768. Its name refers to the name of a neighboring tavern owned by merchant Potseluev; the tavern was called Potseluy! (meaning " the kiss!"). The granite-faced rubble piers support a cast-iron tubing frame, replaced by double-hinged ingot-iron arches in 1907-1908 (engineer A.P. Pshenitsky). The piers carry four granite obelisks with square torches on corbels. In 1952 and 1969, the lost elements of the architectural decor were restored (architect A.L. Rotach). The bridge is 41.5 metres long and 23.5 metres wide. Alexander Nevsky Lavra or Alexander Nevsky Monastery was founded by Peter the Great in 1710 at the southern end of the Nevsky Prospekt in St. Petersburg to house the relics of Alexander Nevsky, patron saint of the newly-founded Russian capital. In 1797, it was raised to the rank of lavra, previously bestowed only upon Kiev Monastery of the Caves and the Trinity Monastery of St. Sergius. 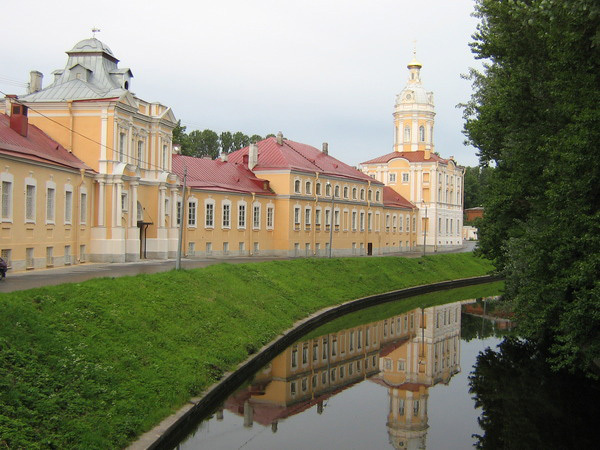 The monastery premises contain two baroque churches, designed by father and son Trezzini and built in 1717–22 and 1742–50, respectively; a majestic neoclassical cathedral built in 1778–90 to a design by Ivan Starov and consecrated to the Holy Trinity; and numerous structures of lesser importance. It also contains the Lazarev and Tikhvin Cemeteries, where ornate tombs of Leonhard Euler, Mikhail Lomonosov, Alexander Suvorov, Nikolay Karamzin, Modest Mussorgsky, Pyotr Tchaikovsky, Fyodor Dostoevsky, and other famous Russians are preserved. 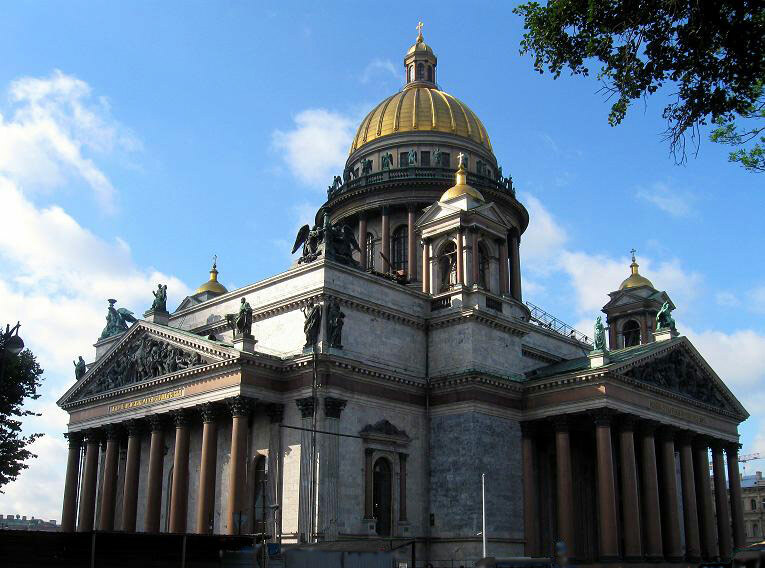 Kazan Cathedral is a name of several Russian churches dedicated to Our Lady of Kazan, an icon which the Russian Orthodox Church probably venerates the most. The principal of these are the Kazan Cathedral on Red Square in Moscow (1638, 1932, 1993) and the Kazan Cathedral on the Nevsky Prospekt in St. Petersburg (1810–1811). The latter church was modelled by Andrey Voronikhin after St. Peter's Basilica in Rome. 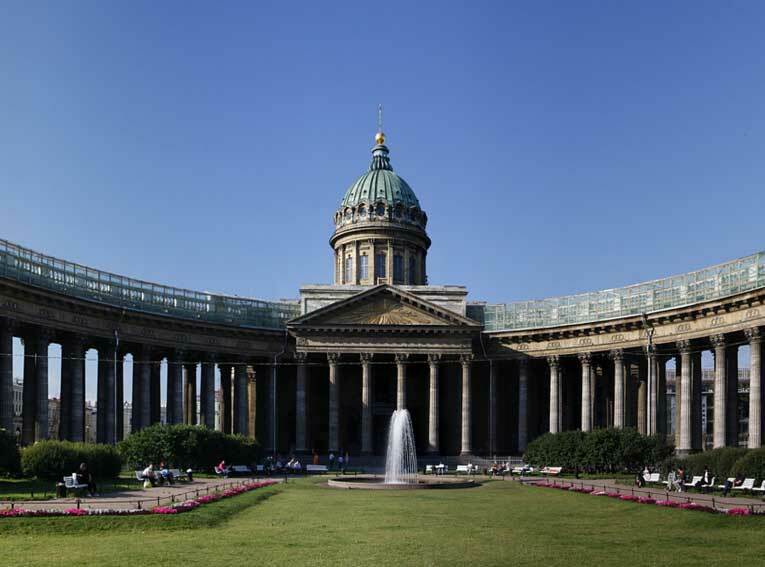 Some art historians assert that Emperor Paul intended to build a similar church on the other side of the Nevsky that would mirror the Kazan Cathedral but his plans failed to materialize. Although the Russian Orthodox Church strongly disapproved of the plans to create a replica of the Popish cathedral in the Russian capital, several courtiers infatuated with Roman Catholicism supported Voronikhin's Empire Style design. The construction was started in 1801 and continued for ten years. After Napoleon invaded Russia in 1812, and the commander-in-chief Mikhail Kutuzov asked Our Lady of Kazan for help, the church's purpose was to be altered. The Patriotic War over, the cathedral was perceived primarily as a memorial to the Russian victory against Napoleon. Kutuzov himself was interred in the cathedral in 1813; and Alexander Pushkin wrote celebrated lines meditating over his sepulcher. In 1815, keys to seventeen cities and eight fortresses were brought by the victorious Russian army from Europe and placed in the cathedral's sacristy. In 1837, Boris Orlovsky designed two magnificent bronze statues of Kutuzov and Barclay de Tolly in front of the cathedral. In 1876, the first political demonstration in Russia took place in front of the church. 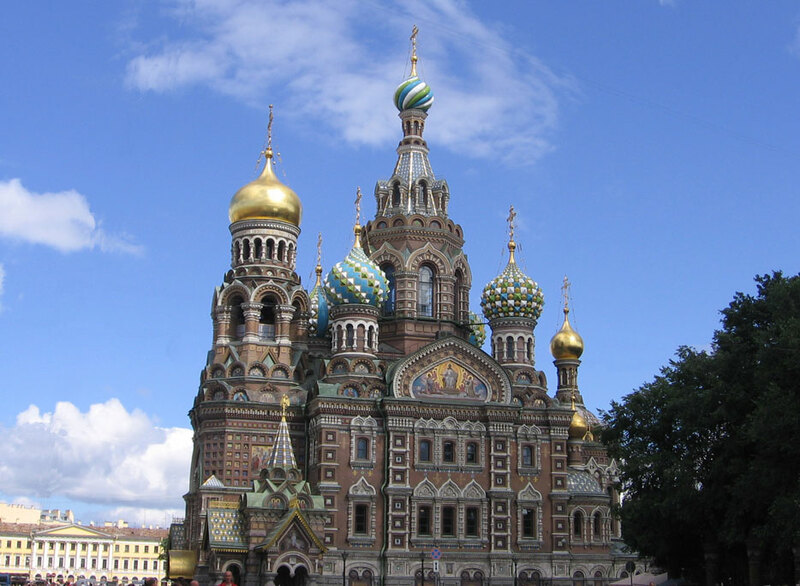 After the Russian Revolution of 1917, the cathedral was closed. In 1932, it was reopened as the Atheism Museum. Services were resumed in 1998; and four years later the cathedral was returned to the Russian Orthodox Church. Now it is the mother cathedral of St. Petersburg. The cathedral's interior, with its numerous columns, echoes a ponderous outward colonnade and reminds one of a sumptuous palatial hall (69 metres in length, 62 metres in height). The interior features numerous sculptures and icons executed by the best Russian artists of the day. A wrought iron grille, separating Kazan Cathedral from a small square behind, is sometimes cited as one of the finest ever created. St. Petersburg's most-photographed church and one of the main sights of St. Petersburg. Construction began in 1883 under Alexander III, as a memorial to his father, Alexander II. The Church is prominently situated along the Griboedov Canal. Both the interior and exterior of the church is decorated with incredibly detailed mosaics, designed and created by the most prominent Russian artists of the day (V. Vasnetsov, M. Nesterov and M. Vrubel). Many tourists come to St.Petersburg simply visit the Hermitage, a museum of awesome size and diversity. 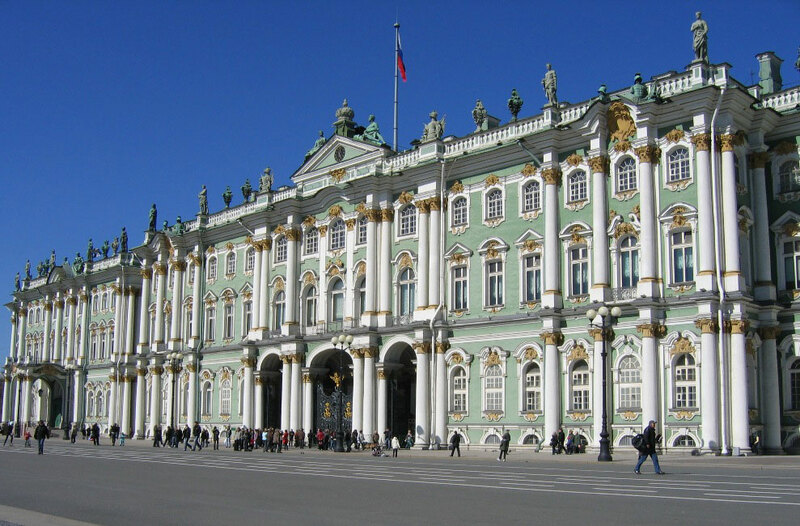 The Winter Palace would be a museum itself even if it didn't hold the Hermitage Museum, one of the world's largest and most valuable collections of fine art. Decide ahead what you most want to see on your first visit. 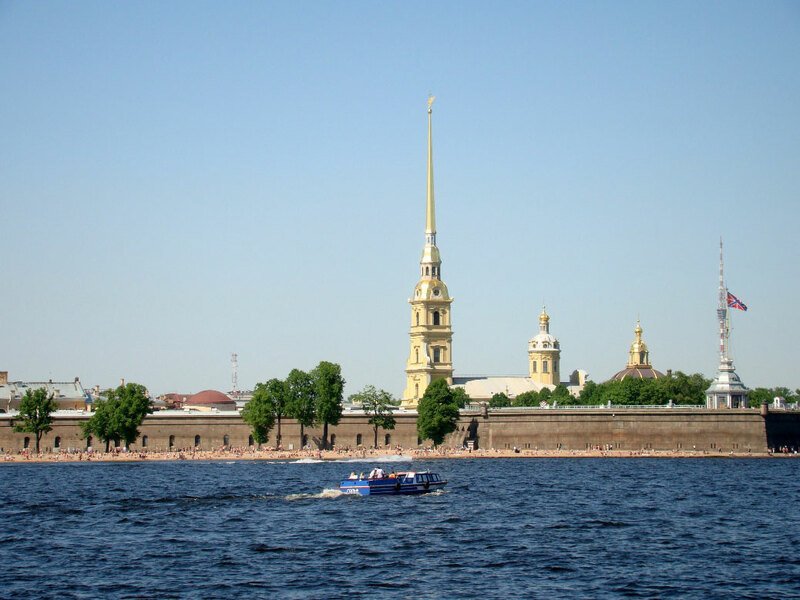 The State Hermitage occupies six magnificent buildings situated along the embankment of the River Neva. At the beginning it used to be a residence of Russian Emperors. Collection: The Western European Art collection includes European paintings, sculptures, applied art from the 13th to the 20th century, including ones created by Michelangelo, Leonardo da Vinci, Rubens, van Dyck, Rembrandt, Poussin, Claude Lorrain, Watteau, Tiepolo, Canaletto, Canova, Rodin, Monet, Pissarro, Renoir, Cézanne, van Gogh, Gauguin, Picasso, and Matisse. Coins and medals, archaeological materials, the largest existing collection of ancient Scythian gold and the antiquities from Black Sea North Littoral Antique; Sculpture, art of the European and Oriental peoples, Russian applied art, an assortment of Fabergé jewellery. Peter and Paul Fortress (1703-1740), architect D.Trezini. The most notable building and the most valuable architectural monument on the grounds of the Peter-and-Paul Fortress, founded by Peter the Great on Hare's Island on May 27, 1703.St. Petersburg's first church was founded on June 23 1712 and the official ceremony was marked by three shots of the guns of the Baltic Fleet ships. After its construction in 1720, and Peter the Great climbed to the top to listen to the chimes and cast a proud look down at his new capital; from that day on, a walk up to the bell tower to see the city panorama was compulsory for all foreign visitors. The bell tower features a haughty pointed golden spire – the symbol of Russia's security on the Neva banks and at the same time the symbol of the modern city – which originally (as well as the church itself) was made of wood and had no lightning deflectors: being badly damaged by fire it caught in stormy weather on several occasions, the wooden framework was replaced with a metal one in 1858. Crowning the spire at the height of 122,5 meters is a weather-vane representing a flying angel with a cross in his hands. Looking tiny from below, the angel in fact is 3,2 meters high with a wing span of 3,8 meters. It’s a burial-vault of Russian Tsars. It's housed in the former Mikhailovsky palace, which in 1898 Nicholas II turned a museum that has become one of the country's most important art galleries. He did so in tribute to his father, Alexander III, who had a special regard for Russian art. 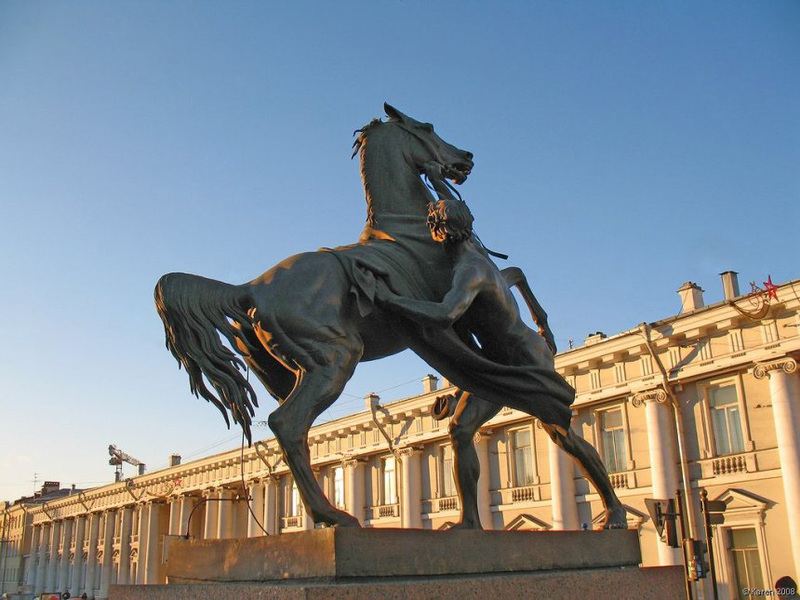 The square in front of the palace was originally named Mikhailovsky Ploshchad for Grand Duke Mikhail Pavlovich (1798-1849), the younger brother of Alexander I and Nicholas I and resident of the palace. The square's appearance is the work of Carlo Rossi, who designed the facade of each building encircling it as well as the Mikhailovsky Palace. Each structure, as well as the plaza itself, was made to complement Mikhail's residence on its north side. The palace was built between 1819 and 1825 years. By these days the collection of Russian Museum is a few times greater than Moscow's Tretyakov Gallery. The illuminated palace by night is a perfect backdrop for romantic assignations. type it's Promo code in the reservation form. Please pay attention you can not use more than one Promo code simultaneously. The Hotel reserves the right to set the restrictions. Promo code is a promotional ID applicable to your booking request with Herzen Hotel, unique for each offer or partner company. Special offers providing discounts, complimentary services and amenities could be seen here. Элементы веб-сайтов ООО "Аквамарин" защищены законом "Об авторском праве и смежных правах" и не подлежат копированию, воспроизведению, распространению, в том числе в переводе, или имитации ни в целом, ни частично без предварительного письменного разрешения. Foreign citizens (except for citizens of Belorussia, Ukraine, Kazakhstan, Tadzhikistan, Kirghizia and some others) visiting Russian Federation need an entree Visa valid for the entire period of stay. Documents - passport,visa and migration form - are subject to passport control on entrance to and departure from Russian Federation. You also require presenting the originals of your documents when checking in at the Hotel, getting on the train / plane, and embarkation aboard ships on both domestic and international lines. There are several types of Russian visas: a tourist visa, a business visa, a student visa, an employment visa, a personal visa, a transit visa - each type corresponds to the purpose of visit; there are more types of visas to be enumerated: diplomatic visas, visas for officials and their family members and so on. Russian visas are also divided corresponding to the number of entries (single entry visa or a multiple visa) and the period of stay (from several days up to few years). During the stay foreigners are allowed to combine purposes of their visit. For example, presence of a business visa to Russian Federation does not contradict the fact of tourist trips or visiting relatives in Russia (private purpose of stay). Moreover, Russian tourist visa does not prohibit business visits to Russia (participating in trade fares, talks, attending conferences) but does not enable to work for hire – Guests are not allowed to get salary on the territory of Russian Federation. Russian visa is issued by Russian embassy or consulate in the country of your residence (citizenship) upon the presence of Letter of Invitation (visa support letter) issued by a travel agency registered as a tourist company in Russia and authorized in the Ministry of Foreign Affairs (MFA) with according reference number. Visa support letter: confirmation and tourist voucher; Russian embassy reserves the right to require the original of your visa support letter. The list of documents can be enlarged for citizens of migration risk countries: Algeria, Angola, Afghanistan, Bangladesh, Vietnam, Jordan, India, Iraq, Iran, China, Democratic People's Republic of Korea, Lebanon, Nepal, Nigeria, Pakistan, Ruanda, Syria, Somalia, Chad, Sri Lanka, Ethiopia, Turkey, Georgia and others. Consular fee is to be paid at the Consular Service Department of the Russian Embassy; the amount to pay varies for each country and also depends on processing period for a visa. According to the Russian law all foreign citizens being accommodated at the hotel on the territory of Russian Federation must have registration within 24 hours upon arrival. Upon check in the Guests should provide their valid passport, visa and migration card (filled in on the plane / train or when passing passport control). Upon the receipt of these documents the Hotel fills in the arrival notice and registers Guest’s visa through Passport and Visa Service (PVS) of the Ministry of Internal Affairs. The Hotel must provide arrival notice (or its copy) approved by PVS to the Guests within 24 hours upon their arrival to the hotel. The Hotel won't be able to accommodate the Guests without the mentioned documents. Violation of visa regulations, for example, loss of visa or departure out of Russia after expiration date of the Visa could be a subject to fine and could possibly cause complications on passport control. Herzen Hotel recommends the guests to have the copy of the first page of the passport, Russian Visa and immigration card with them while staying in Russian Federation. The visa support service fee (for single entry tourist visa up to 30 days) amounts to 1000 Rubles (please be informed that for some countries the cost might be higher). Pre-payment for Visa support service is mandatory and is available with your guaranteed reservation; payment is non-recoverable in case of visa denial, trip cancellation or due to any other circumstances. Any changes to issued Visa Support voucher connected with change of travel itinerary are provided at extra charge (200 rubles per voucher). Herzen House Hotel accepts no responsibility for obtaining required visas or other immigration requirements. Registration of Guests with Hotel Visa Support is provided free of charge for the whole period of stay in the Hotel. If you have questions or contact us. Bolshaya Morskaya Street (referred to as Herzen street in 1920-1993 after Alexander Herzen), located from the General Staff Arch to Kryukov Canal, was constructed in the early XVIII century, in Morskaya settlement (hence the name). Until the middle of XVIII century, the section up to Nevsky Prospect, with only its left side built up, remained a part of Bolshaya Lugovaya Street that ran from Millionnaya Street to Nevsky Prospect. In the 1760s, its right side was built up. In 1834, this lot was added to Bolshaya Morskaya street. After fires of 1736-37, the main part of the street from Nevsky Prospect towards St. Isaac's Square was called Bolshaya Gostinnaya street due to the project of Gostiny Dvor construction. In 1755-67, the street between Nevsky Prospect and Kirpichny Lane was blocked up with the temporary wooden Winter Palace. In the early XIX century, the name Bolshaya Morskaya street became firmly established again. In the second half of the XVIII century, the informal name of the ground beyond St. Isaac's Square was Malaya Morskaya Street. 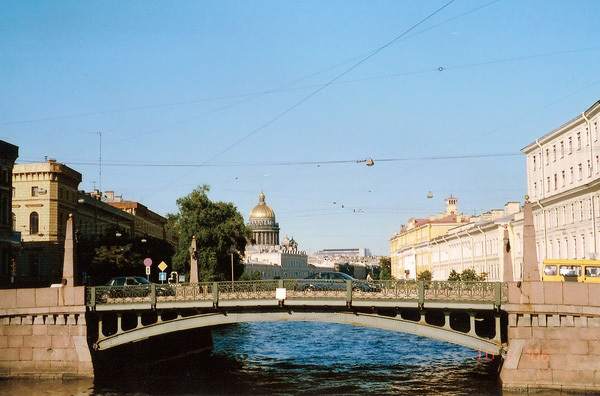 When the system of numbering was introduced, buildings beyond Pochtamtsky Lane got numbers along Moika River Embankment. This lot was again added to Bolshaya Morskaya Street in 1887. In 1902, on account of Malaya Morskaya Street renamed Gogolya Street, the whole street was referred to as Morskaya. The Hotel Building (25) was famous for Lerche restaurant, opened in 1843 by Ministry of Defence Official G.V. Lerche (1787-1876) in his own residence (in literature, the Lerche House; 25 Bolshaya Morskaya Street /11 Gorokhovaya Street; rebuilt in 1838, architect P.P. Jacot with participation of K.I. Reimers). Lerche Restaurant, popular for officers' rouses, was mentioned in Nekrasov's "Talker". From the late 1840s to 1917, the building was owned by the Eliseevs. Herzen Alexander Ivanovich (1812-1870) also known as Iskander - revolutionary, publicist, writer, philosopher - settled at the House of Lerche (Hotel building) in 1840 with his wife and son, and lived there untul his exile to Novgorod in June 1841. Later on Herzen's name was given to the Russian State Pedagogical University in 1920.